Welcome to the September Newsletter. As usual there are lots of quick tips to get you thinking about the food you eat and grow as well as some ways to support your health and healing journey. If you care about your health and avoiding chemicals, then it’s important to think about the materials you use in your garden. 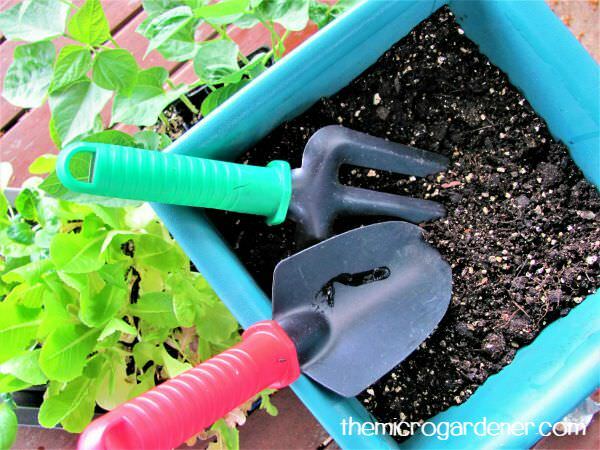 What may seem safe or commonly used may in fact be contaminating your soil and food. In my latest article, I answer this question and share what scientific reports have to say about Polyvinyl Chloride or PVC (plastic recycle #3). 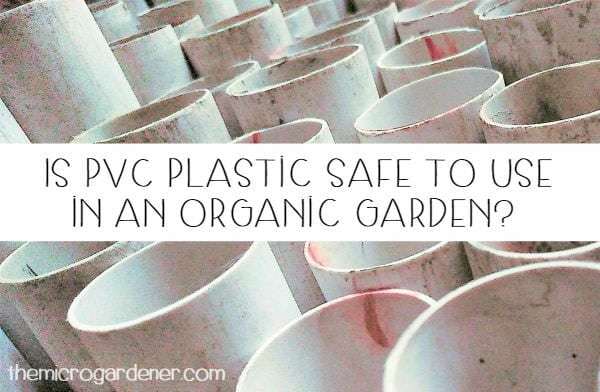 If you use garden gloves, a hose, plastic pipes (such as a worm farm, vertical tower garden, aquaponics or hydroponics) then I urge you to read what the research says. You’ll learn how toxic substances leach into soil and plants, what to avoid and safer options for your organic garden. I also share helpful tips what you can do to have a safer garden. CLICK HERE to read now. 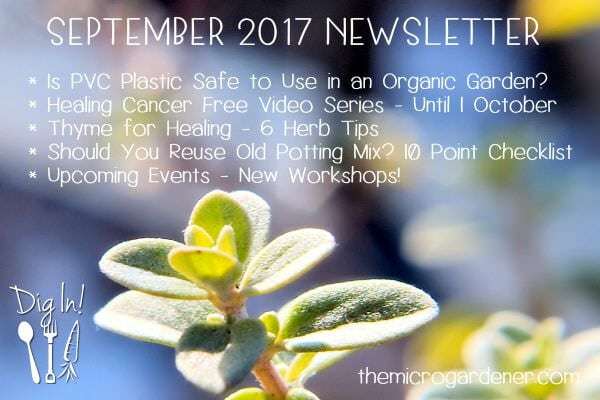 Did you watch the free screening of the SQUARE ONE: Healing Cancer Course I shared with you in the August newsletter? Most of us are touched by someone who has been affected by cancer. Having been a cancer survivor myself, I found this 10 module course a simple, step-by-step guide to both healing and preventing cancer. I’m grateful to Chris Wark, 13 year stage III colon cancer survivor for sharing these incredible presentations. They were honest, real, inspirational, empowering and informative. If you or someone you know can benefit, I encourage you to watch now before the free screening ends. If you missed it, the encore presentation is back online this weekend only. This is a “MUST SEE” for anyone dealing with cancer right now or wanting to prevent it. You don’t need to sign up – just visit the show page to watch! All 10 Modules will stay up until Sunday October 1st at Midnight US time. Are you familiar with this hardy Mediterranean herb? Common or garden thyme (Thymus vulgaris) is a perennial plant with slightly woody stems. It is fine-leafed, low growing and shallow rooted. 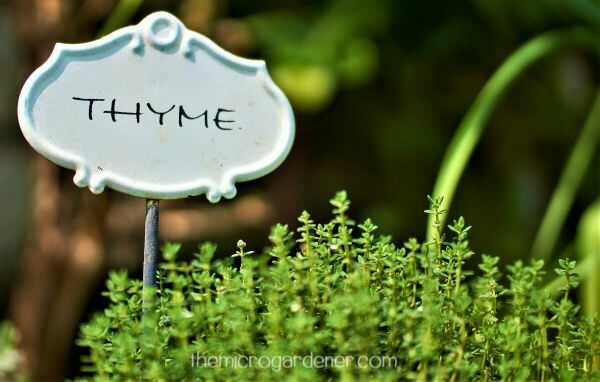 Learn where to plant thyme and other herbs here. Because of its attractive cascading habit, it is useful as an edging or in hanging baskets and pots. Thyme is one of my favourite go-to herbs both for culinary uses in the kitchen and for healing. 1. Avoid wet feet. This herb is a sun lover and once established, is quite happy with small amounts of water. It hates being overwatered. Don’t be tempted. You’ll likely end up with a ‘dried arrangement’! 2. Good drainage. Thyme prefers slightly dry soil, so rockeries, pots and raised garden beds are good spots to grow it. 3. Rub, cook and stuff it! Thyme is fragrant and quite strong in flavour, so a little goes a long way. Use in marinades or to rub over meat or fish, in stuffing and it’s delicious with eggs, tomatoes, pasta and flavoured vinegar. I also use in savoury muffins, pancakes, scones, bread and herb butter (to die for)! 4. Medicinal uses. Thyme aids digestion, so you can use as a sprinkle over meals. It may help settle the stomach, kill germs and fungi and can be used as a gargle for sore throats and mouth ulcers. Pretty cool hey? 5. Tea Thyme. Add 2-3 teaspoons fresh or 1 tspn dried thyme to a cup of boiling water. 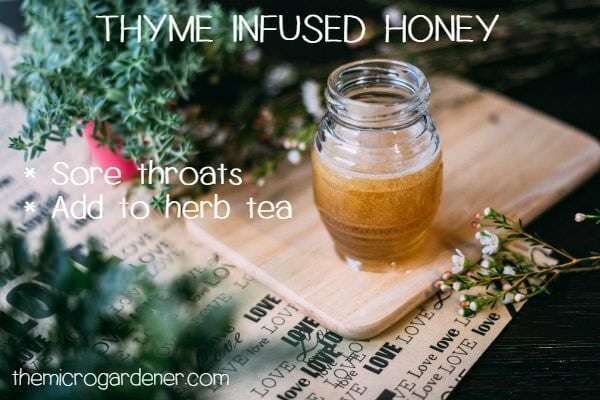 I’ve used thyme tea as a gargle for sore throats or laryngitis (when you lose your voice) – not that my husband minds! I’ve also found it very effective to inhale the hot tea vapours to relieve a blocked nose. Learn how to Grow your own Herb Tea Garden here. 6. Preserve it. When using fresh or dried thyme in cooking, add just at the end because heat can cause the flavour to be lost. You can also dry fresh leaves for a few days on a tray and keep in a sealed jar. You can grow thyme from seed, cuttings or seedlings. Whether you use it fresh, as a dried herb or in a delicious tea, I encourage you to choose organic. Avoid pesticides and chemicals and reap the full flavour and health benefits of this healing herb. Should You Reuse Old Potting Mix? If your potting soil is old and dry, it’s likely ‘hydrophobic’. Just a fancy word meaning it is repelling water, rather than holding the moisture in the soil. That’s not a good thing because it’s hard to re-wet. Dry, lifeless soil grows … dead plants! Not what you want, I imagine. Having trouble with your potting mix? Time for a quick check to see if it’s time to re-pot your plants! In this article, I answer the question in depth, providing you with ways to revitalize ‘dead dirt’ and give you a 10 point checklist to find out if it’s time to re-pot your plants. I also share six ways to re-use old potting mix rather than wasting it. Dig in here. Some of my juiciest tips ever!